The concept of the Daniel Fast comes from the biblical account of the Old Testament prophet Daniel when he prayed and fasted to ask for spiritual guidance. There are two biblical scriptures concerning the Daniel Fast, from which we get different guidelines. Since there is no way to know exactly what Daniel ate, the modern-day Daniel Fast may be done two ways: strictly adhering to biblical accounts, or following more general guidelines according to your physical and spiritual needs. When trying to decide what to eat for breakfast, you may ask yourself if you can have oatmeal on the Daniel Fast? Yes, you can. Unlike other kinds of spiritual fasts where you abstain completely from eating or drinking, the Daniel Fast is a partial fast that provides limited nourishment for your body. It lasts anywhere from 10 to 21 days. The fast is meant purely for spiritual reasons and not for health benefits. While the Daniel Fast is meant to be a sacrifice for religious purposes, many church congregations use this type of eating to improve the health of their parishioners. In addition there is now data, according to an article in Healthcare, that the Daniel Fast helps improve health in the short-term. According to biblical accounts, Daniel ate only foods grown from seeds and drank only water. If you follow a more modern-day Daniel Fast, you may eat all plant-based foods such as fruits, vegetables, nuts and seeds. You may also eat whole grains such as oats, wheat, barley and corn. Additionally, you may have liquids such as water and vegetable or fruit juices. Since oats are a whole grain, you can eat oatmeal on the Daniel Fast. However, if you want to follow the stricter guidelines, then you should prepare oatmeal at home instead of buying the packaged version. Packaged oatmeal uses quick cooking oats, which are processed and should be avoided on the diet. 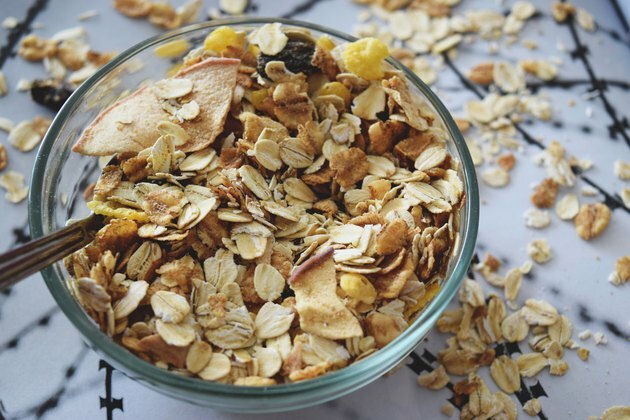 You may use oat bran, rolled oats or steel cut oats. You may add fruits such as raisins, bananas, chopped or blended apples, peach or pear, to sweeten the oatmeal. You may also add spices such as cinnamon and nutmeg for flavor. Boil water on the stove or in a tea kettle. Measure out 1/2 cup of oats and pour one cup of boiling water into the oats and let it sit until the oats absorb the water. Add fruit, nut butters, and/or spices. Add 1 cup of water to a saucepan and heat just until boiling. Add 1/2 cup oats and reduce heat to simmer and allow the oats to absorb the water. Flavor with fruits, nuts, and/or spices. Add 1 cup of water and 1/2 cup of rolled oats to a sealable container. Place in the refrigerator overnight and the oats will absorb the water. Add fruit or nuts in the morning. Eat cold or warm in the microwave. Being on a Daniel Fast doesn't mean you have to give up all of your favorite foods. With a few clever substitutions, you can have your pancakes and eat them too. In a small bowl, add 1 tablespoon flax seed meal and 2.5 tablespoons water. Mix together and set aside. In a blender, blend together 1 medium banana and 1/4 cup oats, blend very well and add the flax and water to the blender and blend until smooth. Use this batter as you would any other pancake batter. Use a teaspoon of coconut oil in a non-stick skillet to keep the pancakes from sticking and cook on a medium low heat. This makes 1 serving - three 4-inch pancakes. Top with fresh fruit. Even if you're not a genius in the kitchen, it is possible to make a cookie that adheres to the guidelines of the Daniel Fast. That means no dairy, eggs, or sugar. With a few healthy substitutions of ingredients like bananas and applesauce, and concentrated natural sugar sources such as raisins, you can have an oatmeal raisin cookie without worry. While the biblical guidance on foods to avoid on the Daniel Fast is not clear, there are many notations in the bible about eating unleavened bread. Those on a traditional fast may choose to forgo leavening agents, such as yeast and baking powder. You should abstain from all animal and dairy products, and sweeteners such as honey and sugar. Artificial and processed foods, chemicals and food additives are also not allowed. Researchers conducting health related research on the Daniel Fast allowed their study participants to drink decaffeinated coffee and tea, but otherwise caffeinated beverages and alcohol are not allowed. You should prepare all your meals by hand and always read the ingredient lists on any packaged or canned food you choose to buy for the Daniel Fast.